Dr. Keith B Stolte, MD is a Doctor primarily located in Spring Hill, FL, with another office in Spring Hill, FL. His specialties include Ophthalmology. He speaks English. The overall average patient rating of Dr. Keith B Stolte is Good. Dr. Keith B Stolte has been rated by 37 patients. From those 37 patients 24 of those left a comment along with their rating. The overall rating for Dr. Keith B Stolte is 3.2 of 5.0 stars. I went to Dr Stolte because he is the only Ophthalmologist that takes my insurance. I really like his staff. Very friendly. I required and ultrasound and laser surgery. He did the ultrasound for free right in his office. And the laser was in his office too, as an outpatient. He did a great job. No pain, no inflammation. I had to have the other eye done a week later. same result. I really liked Dr Stolte and his office staff. Worst experience ever. 40 minutes in the waiting room. And he didn’t even show up. Made the second appointment got there and only tried to do was sell me other things in the office. I would never recommend him. He stood in the hallway and talk to his employees complaining about someone longer than he did with his patients. Dr. Stolte did my cataract surgery nine years ago, and my vision has been near perfect every since. 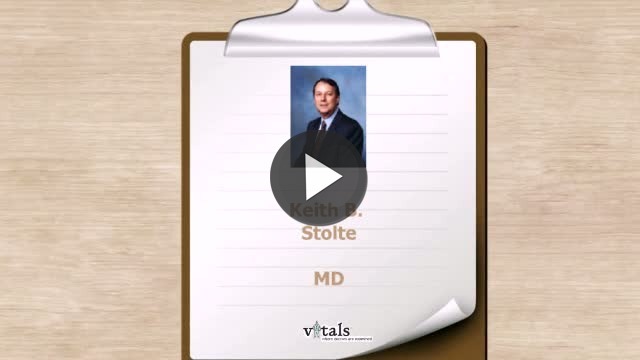 Take a minute to learn about Dr. Keith B Stolte, MD - Ophthalmology in Spring Hill, FL, in this video. Dr. Keith B Stolte is similar to the following 4 Doctors near Spring Hill, FL. Have you had a recent visit with Dr. Keith B Stolte? Select a star to let us know how it was.